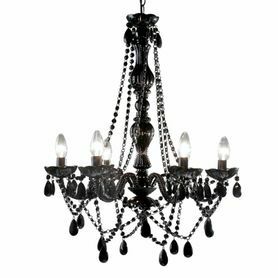 Our Large Black Gypsy Chandeliers collapse for easy storage and transport, making them a favorite for event decorators. This chandelier has 6 arms, each with a pendant adorned scalloped cup. 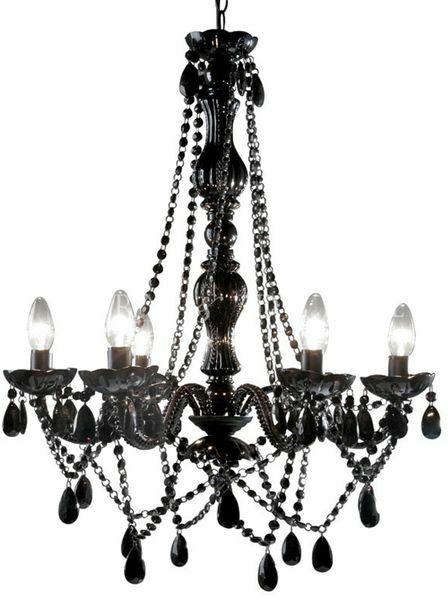 There are acrylic strands of faceted beads between each arm and from each arm to the base of the chandelier body. Each strand also has a beautiful, 3" faceted pendant hanging from it. All the strands and pendants are attached with small jump rings so it's very easy to add or subtract bling and the arms are moveable which makes for easy storage and travel . The ceiling cap is 5.25" in diameter and 2.5" deep and this is a hardwire unit. The chandelier body is 22" in diameter and 25.5" tall from the top of the body to the bottom hanging pendant. The hanging cord and chain, from the top of the body to the ceiling cap, is 23.5" long for a total hanging length of 49". Use six E12 bulbs, max 25 watts each (bulbs not included). A beautiful and easy way to glam up your event or for your everyday enjoyment! These lamps are hard-wired and require installation by a qualified electrician. It can also be converted to plug-in style by an electrician. This chandelier weighs just under 7 lbs. I bought this to fancy up my laundry room. 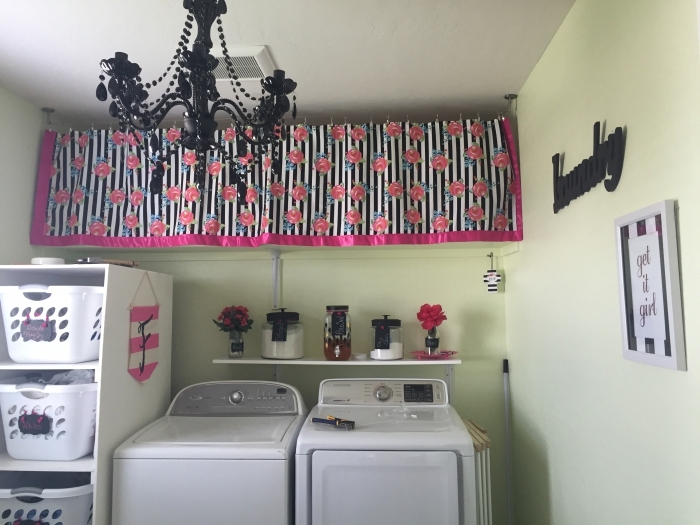 I wanted to make it into a girly paradise and this did the trick! Merchant Response:Super cute!! If you have to do laundry, this is the place to do it. We love the girly vibe going on in your space. Thank you so much for sharing.